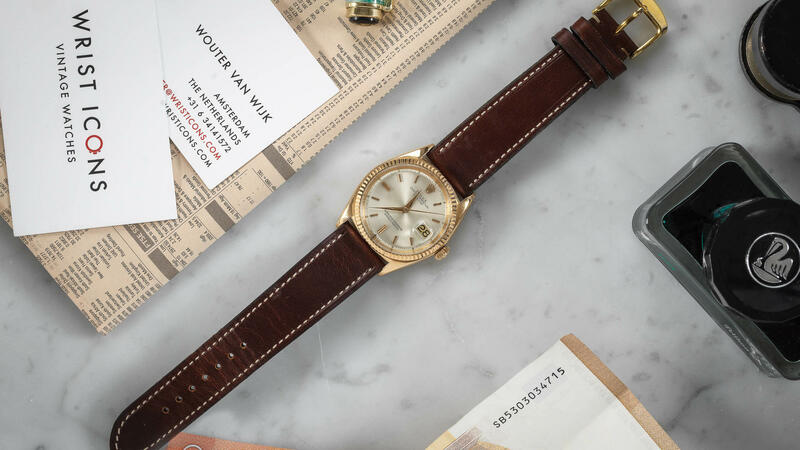 This is a rare opportunity to buy a 1963 Rolex Datejust with a rosé gold case. Rolex Datejust watches are not so rare. But in rosé gold they are really rare. 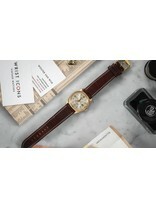 So pull the trigger and treat yourself on a lavish rosé pie-pan dialed Datejust! 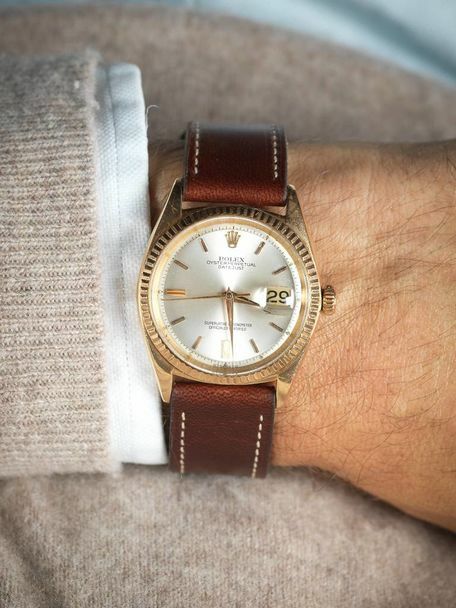 The Datejust has set the bar for luxury watches since 1945, when this Rolex© marvel became the archetype for the modern watch. 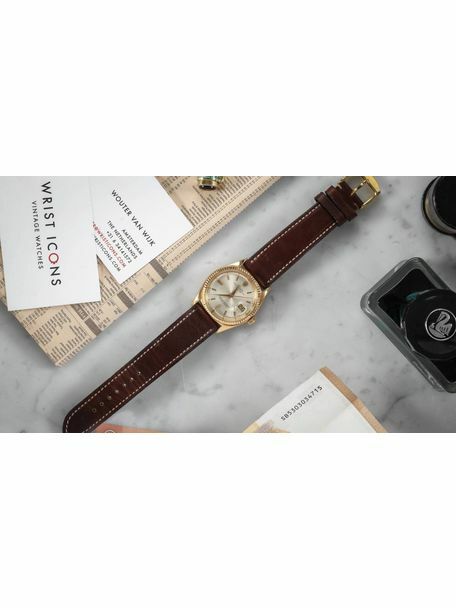 Inspired for and by the ocean, the Datejust’s revolution was a fully waterproof, automatic chronometer framing a date in the window--the first of its kind the world ever knew. This Datejust’s elegant design features a dazzling silver dial with rose golden hour marker and rose gold hour hands, and the scratch-resistant crystal’s cyclops eye makes it one of the world’s most recognizable watches. The Oyster architecture constitutes a 36mm case and bracelet which seals the timepiece’s dignified look. Mid-decade, the ref. 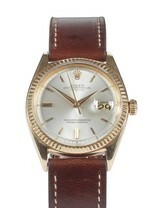 1601 Datejust was launched. With a caliber upgrade from the previous Cal. 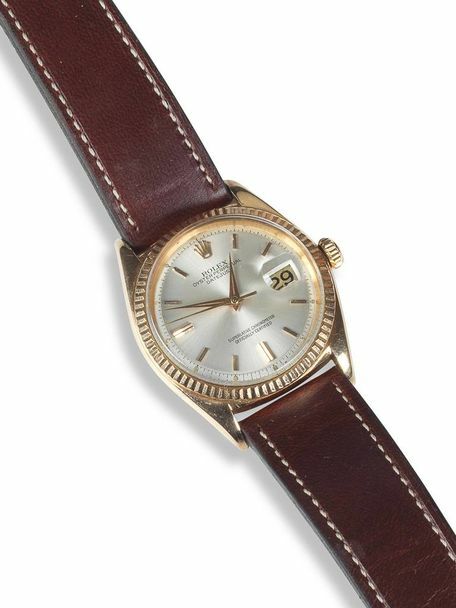 1065, it was now powered for the first time by Rolex’s own 1500 series. Built around the architecture of the base Cal. 1530, early versions used the Cal. 1560, and received a further update in 1971 with the Cal. 1575, which brought with it the convenience of a hacking function. From their first in-house series of calibers, the 1560 and 1575 were to become benchmarks in the world of mechanical watch movements, for their accuracy and resilience. Beautifully simple and extremely robust, they are highly regarded even today for their engineering excellence. 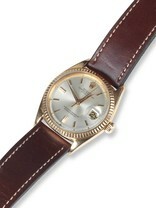 Inside this Rolex Oyster Perpetual Datejust 1601 houses a mechanical automatic self-winding Rolex caliber 1560 movement. The 1560 was the start of the second generation of the 1500 series calibers. They released this movement in 1959 and it remained in use until 1965. 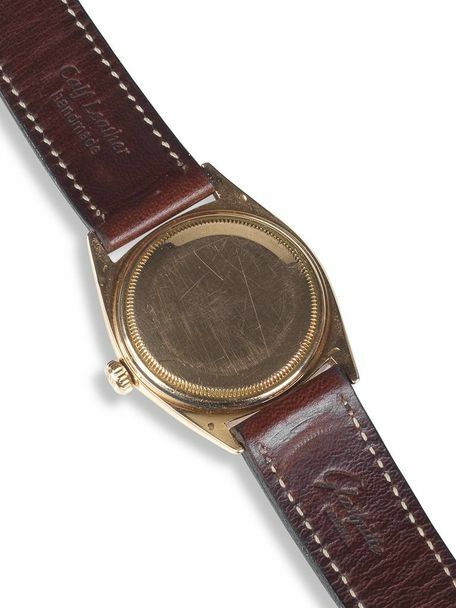 With a 26 jewel self-winding automatic movement, it had a Rolex p/n 7980 balance assembly with Microstella screws, a Bregeut free sprung hairspring. It also had a frequency of 18,000 bph. Furthermore, the KIF Flector shock absorbers protected the 1560. Also, it used a traditional stone lever escapement and had a power reserve of 42 hours. Rolex released this series with a date function version, the 1565, and with the addition of a 24-hour hand in the 1565GMT. Although there was no Quickset mechanism, the 1500 calibers came with the cam and jewel system. This system was able to create an instantaneous date change at midnight, still used by Rolex today. 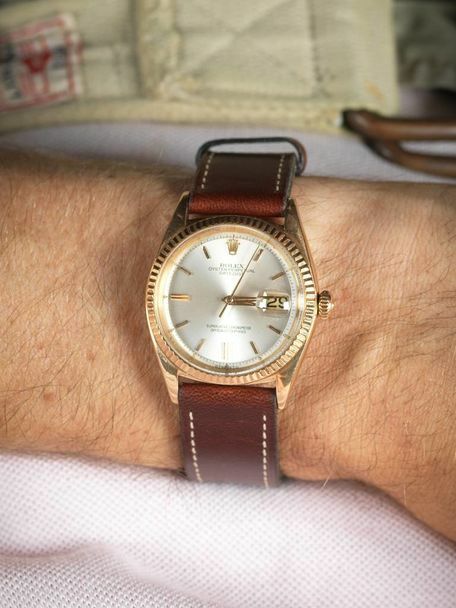 The watches themselves emerged in every conceivable permutation of bezel and dial detailing, with either yellow gold or two-tone Rolesor cases, or as the version we have here at WRIST ICONS, in a handsome rose gold. Our Datejust is a perfect example. The case of this Datejust with its rose gold structure gives the watch a warmer and much softer appearance than steel or white gold, but without the brashness that can come with an all yellow piece, the case of our 1601 glows rather than shines. The pie pan dial, is finished in a more harmonizing silver with rose gold index hour markers. The rose gold stick indexes catch the light beautifully due to their beveled edging and the surrounding fluted bezel sets the whole watch apart as a modest statement of discreet luxury. This example is in excellent pre-owned condition and has a rosé golden 36mm size case with a chronometer rated automatic movement. Originally this was a gentleman’s Rolex Datejust (1601) featuring a champagne colored pie-pan dial with sword hands dial with an acrylic plexi glass crystal and an external cyclops date aperture at 3 O'clock. The watch case is surrounded by a jubilee golden bezel. It has an brown leather strap with a Rolex buckle. This particular watch comes complete without its original box and all relevant paperwork. This particular watch has just undergone a full service. This work was carried out by our Rolex authorised watchmaker using Rolex parts.